This is th first time I have tried Travel Puff Makeup Take Out by ColoreScience. I have the one in All Even – It is Medium tone, pale yellow foundation. It is also use as a corrector. It’s not spectacular but it’s not all bad either. One puff is good for 10 – 20 applications. In the Wild – Soft golden peach nronzer. Kissed By the Sun – Medium caramel brown bronzer. All Even – Medium-tone pale yellow foundation, also use as a corrector. Pat and Rub! Just pat Colorescience Suncanny Travel Puff against your skin to release the pigment. Then blend gently across the face for sheer even coverage. Pat two to three times to release more pigment. Apply more pressure on the sponge to get heavier coverage. 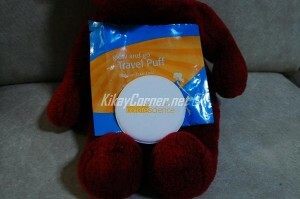 Put the puff back into the travel pouch for additional uses. Once the sponge is empty, the sponge is still good for many other applications. Washable and reusable.